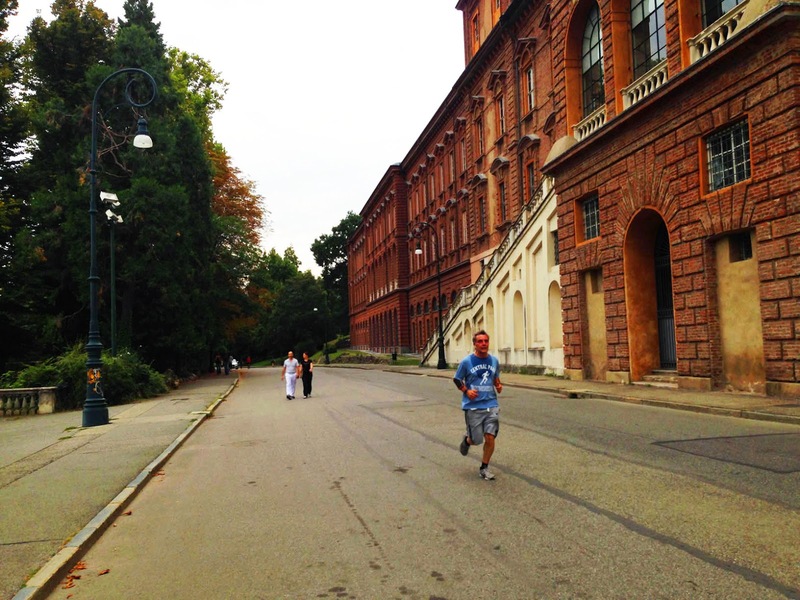 If you're wondering where all the runners are in Turin, here's the story: they're all in Parco del Valentino. This shady riverside park just south of the town center is full of trails and provides a great running area. The park has lots of variety, and has some car-free tracks, as well as some other almost-car-free tracks. 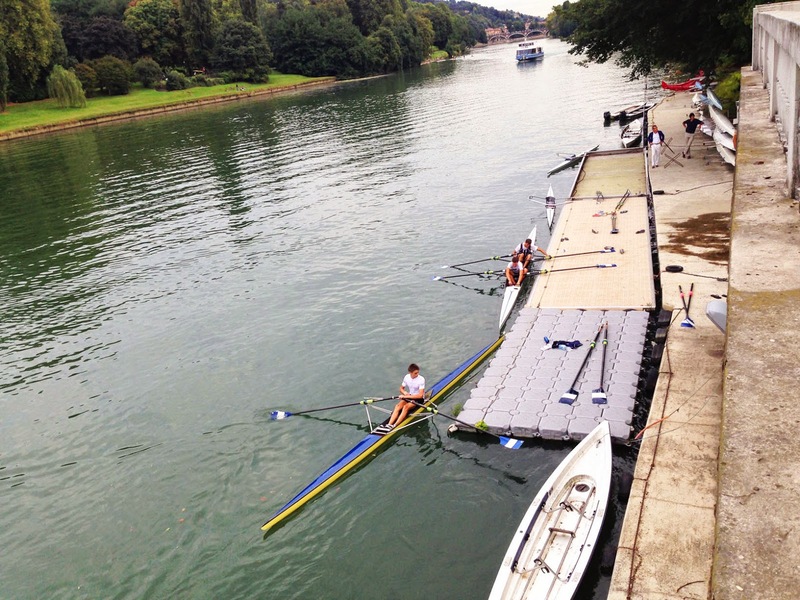 And, as it's situated on the River Po, you can combine it with a further run along the river trail (such as the other Turin route, the River Run). Parco del Valentino isn't terribly big, but there are all kinds of interesting things there: Valentino Palace, a botanical garden, a recreated medieval town (complete with castle), cafés, playgrounds and sports fields, a fine-arts museum, and lots of other fountains, gardens, and nice spots for folks to hang out in. And lots of people do that on nice afternoons and evenings. 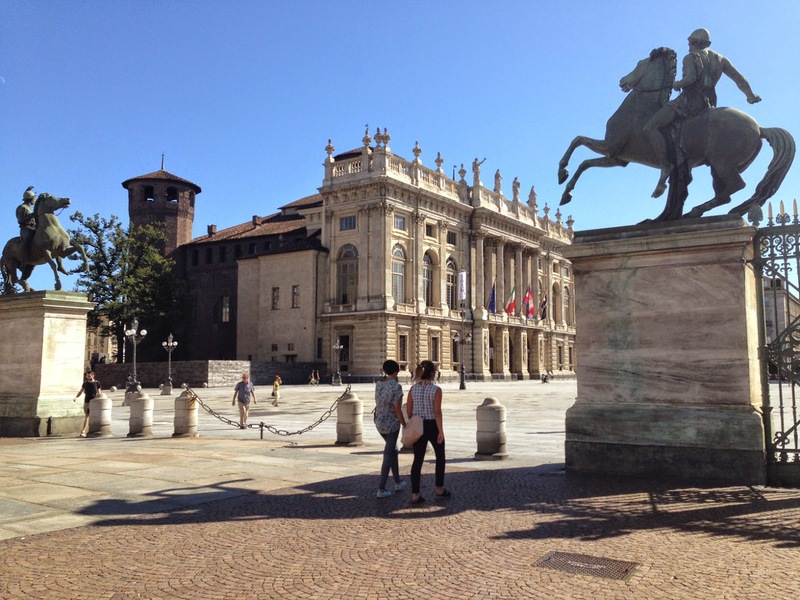 Like the Turin River Run, this route starts at Piazza Castello, the square in front of Palazzo Reale (the royal palace, from back when Italy still had kings). When standing on the plaza, facing ornate Palazzo Madama at the Garibaldi statue, turn to your right and run straight down that street heading southwest, Via Roma, the one with the arcades leading off to a church tower a few block away. So off we go, heading down Via Roma. 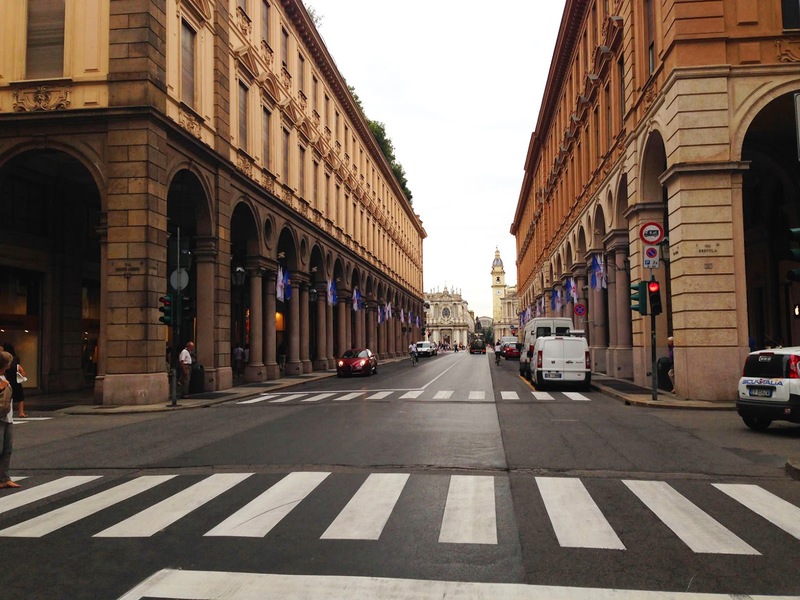 Via Roma is Turin's main expensive shopping street, full of designer shops, and full of shoppers. So it's best to run on the strip of sidewalk outside the arcades, along the street, and you'll avoid the crowds. 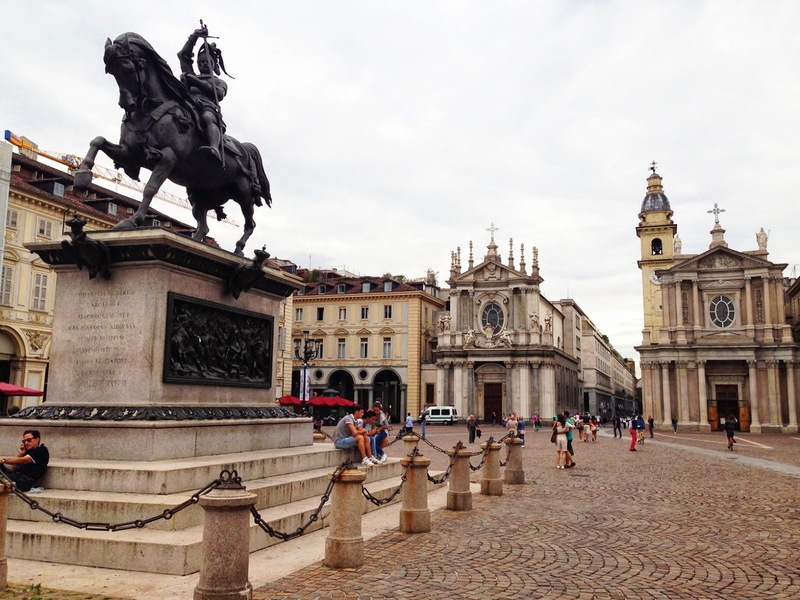 In three blocks you'll come to Piazza San Carlo, Turin's most elegant square, with twin baroque churches and more arcades. Run straight through the plaza to the churches. At the end of the piazza, turn left onto Via Giolitti to run eastwards. After four blocks, cross diagonally to right and run through Piazalle Fusi which is a strange, empty, open space with air-vents going way down into unseen depths. 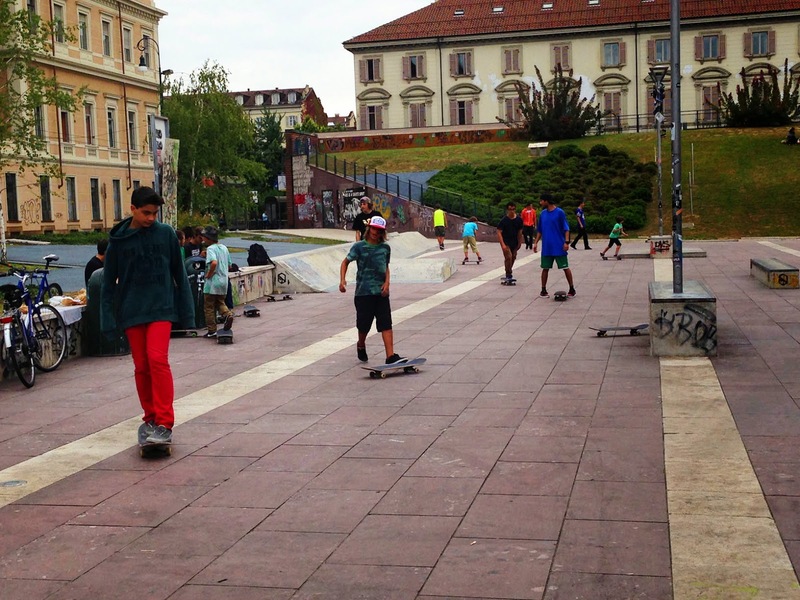 The plaza was conceived to be a skateboard park, and you'll find skaters on the other side. Exiting the plaza at the southern corner, turn left onto Via Cavour, heading east again, towards the river. 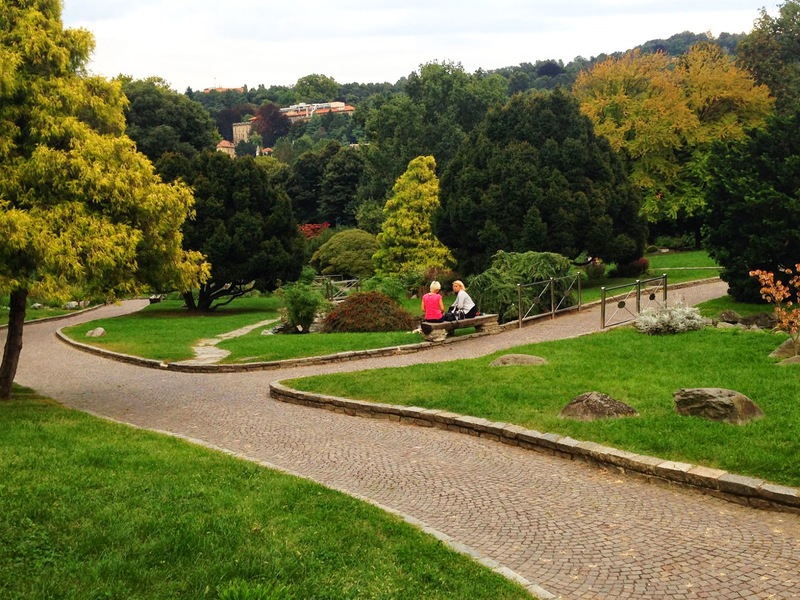 There's a nice little park to the right side, Giardino Balbo, and it's nicest to run down the park path here. 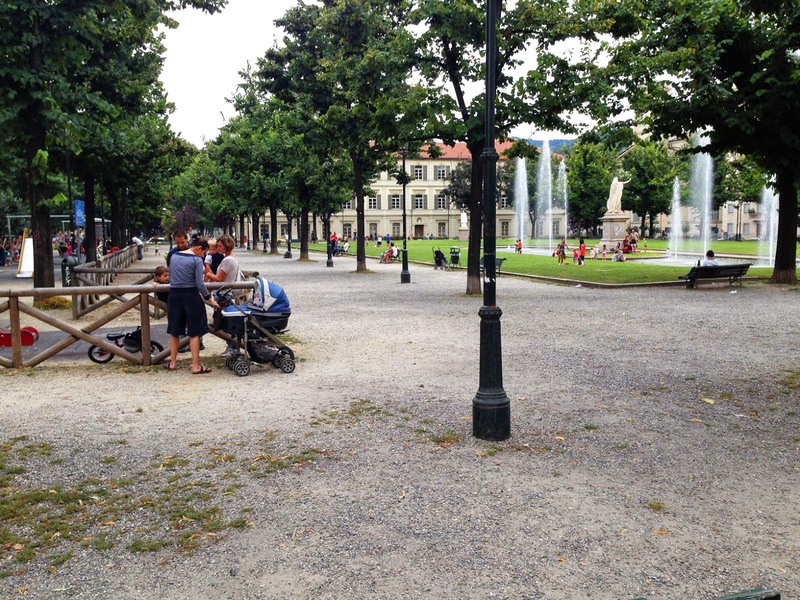 This lively park has a playground and is full of parents and their kids. 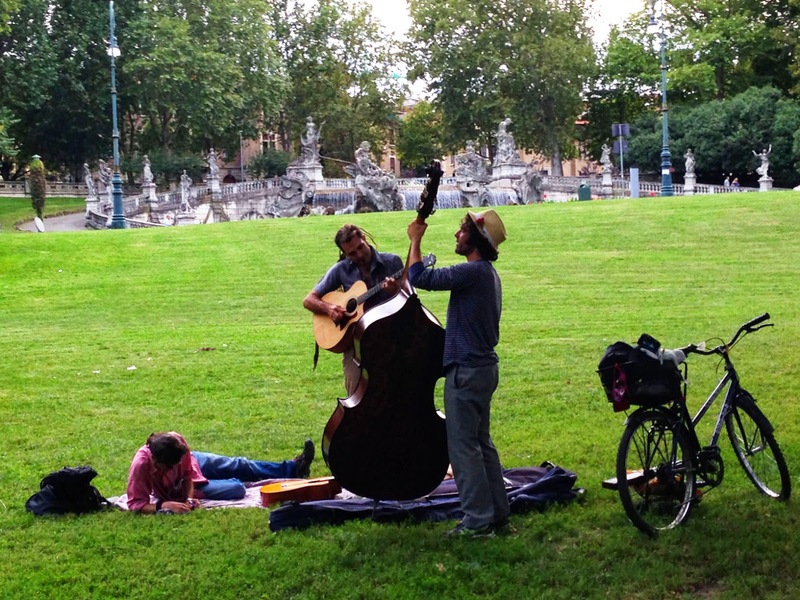 At the end of the park, Cavour continues into another little (equally lively) park, Giordino Cavour. These parks were made possible after the old town defenses were torn down and room was created for the town's wider boulevards and parks. At the end of Giordino Cavour park, turn right and run to the end of the block -- where the old church is -- and then turn left onto Via dei Mille, where you can run the last three blocks to the river. Cross the busy riverside street, Corso Cairoli, at the Garibaldi statue on the bluff above the river. Below you is the riverside quay formerly used by local fishermen, the Murazzi. Now it's the home of a stretch of beach bars and activities set up every summer. Now, turn right, following the river southwards. 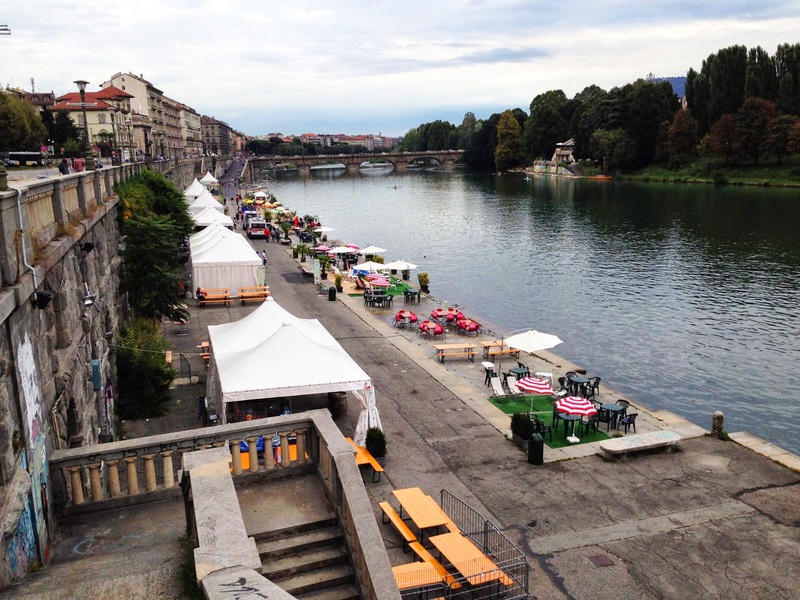 The pedestrian trail goes down a bit first, then back up to the street level at the next bridge, Ponte Umberto I. Just ahead of you, you'll see Parco del Valentino, at the monumental arch in the road. Running southwards, stay along the trails near the river. 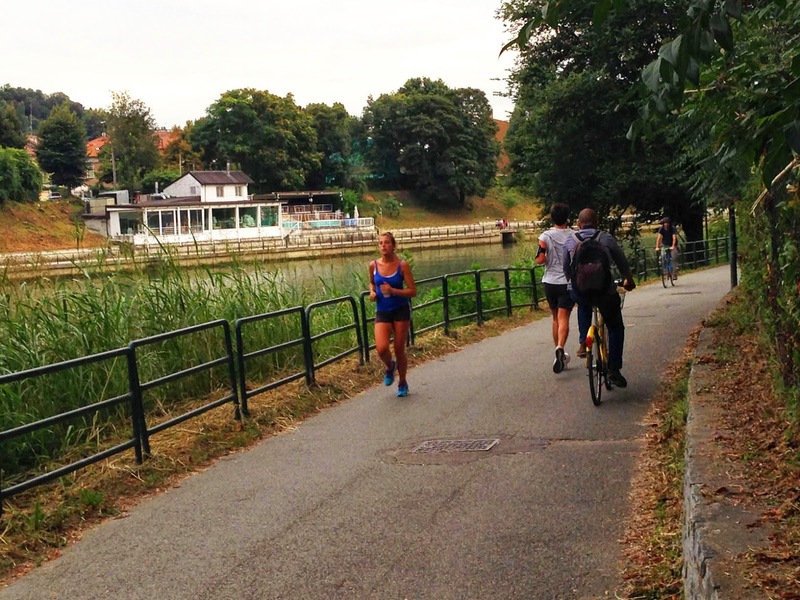 After a couple of riverside cafés and the rowing club, the trail merges into a paved street without cars, Viali Virgilio. Follow this street westwards and you'll suddenly discover where the other Turin runners were hiding: this is the place. Every runner in town seems to be here, running behind Castello del Valentino. The back side of the palace is a brick facade looming above the road on the right. 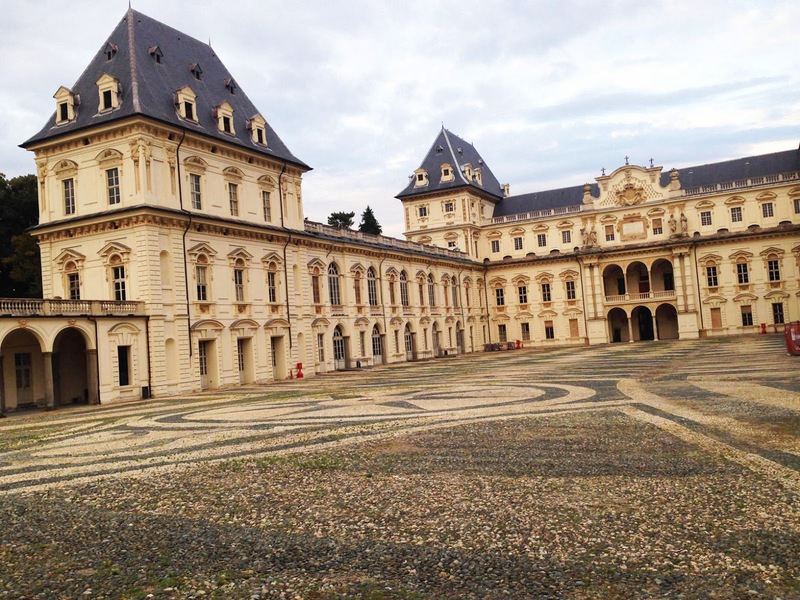 The palace was owned by the Dukes of Savoy, and is now used by the Polytechnic University. 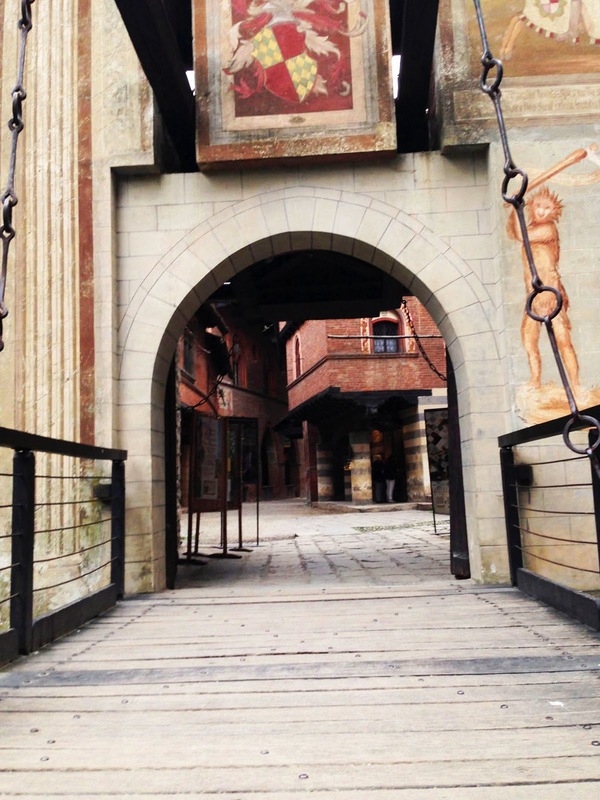 This pedestrian road then goes by (or through) a replica medieval town, built for an expo that happened more than 100 years ago. I went through it and looked at all the buildings, because I like history, but you might as well slow to a walk in there. Past the medieval village, you come back into the main park, with a nice view of the river along the tree-covered shore. When you reach the end of the park, you'll run under the next bridge, where you'll see a section of a submarine on the right (put there as a war memorial for Italian sailors). This is the half-way mark of the run. NOTE: If you want to add distance, just continue southwards on the riverfront path, and you'll go through a few more parks. Now running north, back in Parco del Valentino, either follow the same way back (that's the quietest, greenest, pleasantest way), or follow the almost-car-free road, Viale Boiardo, that branches off to the left to see the other side of the park. If you take Viale Boiardo, you'll run a bit uphill past a big fountain, go past a formal garden on the right and then -- at the top of the hill - go past athletic fields and a giant noisy playground and café. Now run past the fine arts gallery and past the front side of Valentino Palace and its botanical garden. After that, the street merges back into Viali Virgilio near the river, where you entered the park. So now run back the way you came, except instead of following Via Roma for the last few blocks, try a quieter street: two blocks before Via Roma, turn right onto Via Carlo Alberto. This is a quiet pedestrian street that also takes you through a further nice square, Piazza Carlo Alberto, flanked by twin palaces. The street ends by running into Via Po, where you turn left and run back into Piazza Castello in just a few steps.